Something fun happened to me on the Internet today. Although small… so very small. I have finally left my mark! 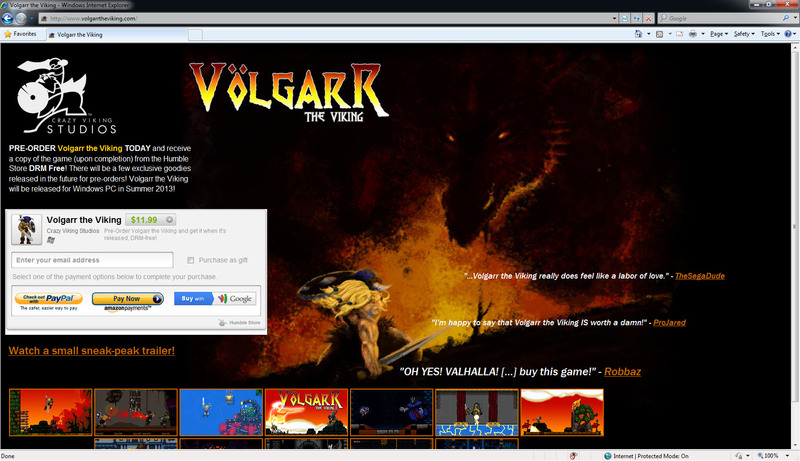 A blog post I wrote about the very excellent game Volgarr the Viking had a quote drawn from it and used in an effort to promote the sale of the game. How fun is that?! It’s a bit hard to read but you can click on the image to see a larger version or better yet visit www.volgarrtheviking.com to see the live pre-order site. My thanks to Crazy Viking Studios for making my day! As the game has been evolving and showing even more polish you can see what hasn’t changed. Volgarr the Viking is going to be wonderfully punishing. Check out this sneak peek video showing an expected learning curve for a would be Champion of Odin. And of course both Robbaz and DMJared are also showing their support on the Volgarr the Viking pre-order page and have each created their own very entertaining videos featuring the game. NICE. Well, done dude!!! And hey, what do you expect when ya do a good write-up? That’s one more reason to do reviews, sir! I’ve been quoted on game boxes before (PC titles like Daemonica and Xpand Rally and some other old stuff), but like you, I didn’t expect it until I got an email saying I was being quoted or a copy popped up in the mail and surprised me. Hey geelw. You’ve made it onto retail boxes eh? That’s very cool. I hope you bought those games as keep sakes. I didn’t actually get a notice, I just found my quote by chance. It was very surprising. It was a fun thing to stumble apon. Are they only releasing the game digitally?